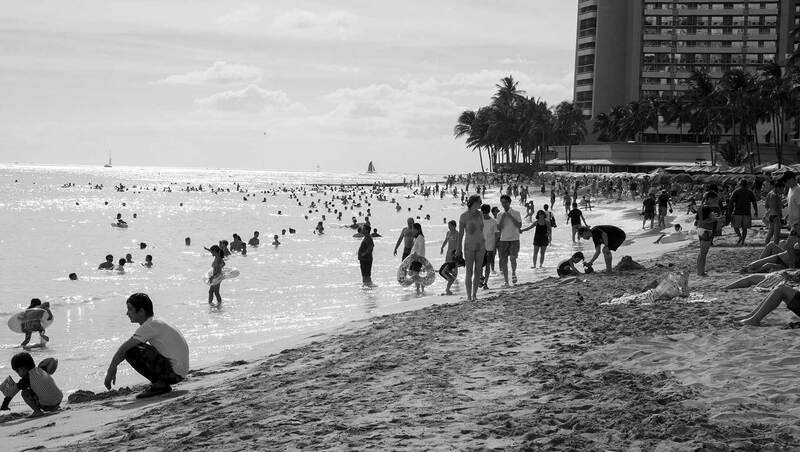 WASHINGTON, D.C. -- Hawaii residents reported the highest wellbeing in the U.S. in 2018, reaching the top spot for the seventh time since Gallup began tracking wellbeing in 2008. Hawaii and Colorado have ranked among the top 10 states in wellbeing for the 11th consecutive year, the only two states to do so. West Virginia residents reported the lowest wellbeing for the 10th straight year. Wyoming, Alaska, Montana and Utah -- all states that have frequented the top 10 list in past years -- rounded out the top five in 2018. Arkansas, which was ranked 48th in 2017 and 2009, was ranked 49th in 2018 -- its lowest level ever -- and was followed by Kentucky, Mississippi and Tennessee. Gallup has been tracking wellbeing nationally since 2008. Career wellbeing was previously named "purpose wellbeing," but the definition has remained constant. As in prior years, wellbeing in the U.S. exhibits regional patterns. The Northern Plains and Mountain West are higher wellbeing areas, along with some Western states and pockets of the Northeast and Atlantic. The lowest wellbeing states are concentrated in the South and extend northward through the industrial Midwest. 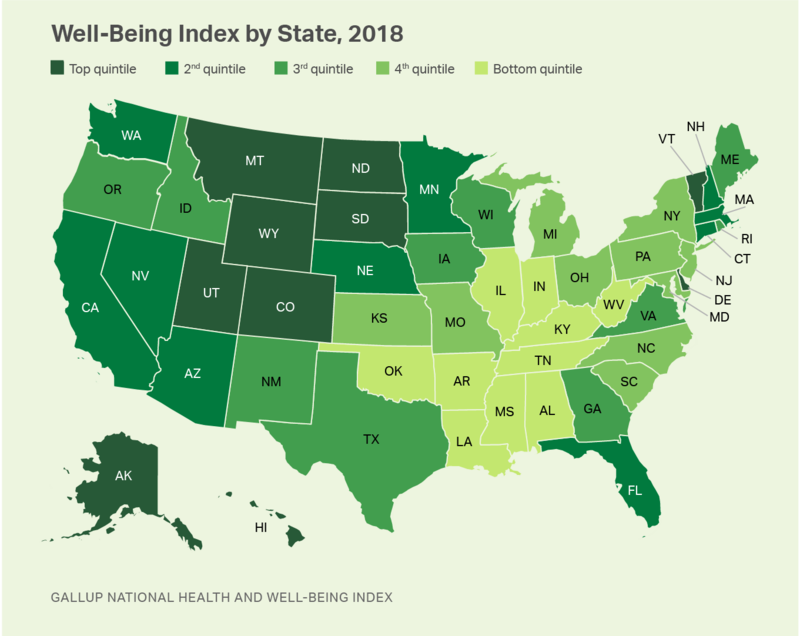 Wellbeing in the U.S., overall, continued to decline in 2018, with the national Well-Being Index score sliding to 61.2 from 61.5 in 2017. This extends a deterioration that began in 2017; over the past two years, the Well-Being Index has dropped 0.9 points. While the declines were not as acute as in 2017, 2018 saw a continuation of some of the same narratives that were used to describe 2017's drop, including erosion in social and career wellbeing. Not all elements, however, suffered from these declines. Physical wellbeing improved in 2018, while financial and community wellbeing were unchanged. The less-severe drop nationally in 2018 was characterized by a much more balanced performance among states -- nearly as many had statistical improvements (seven) as declines (eight) when compared with the 2017 measurement. This was a far different year-over-year outcome than the record-setting change among states in 2017, when 21 states suffered a significant decline in wellbeing against no states that improved. States that improved in 2018 were Alaska, Delaware, Wyoming, Nevada, Louisiana, Washington and Ohio. States that declined were Florida, Illinois, Alabama, New York, Texas, North Carolina, Kentucky and Tennessee. Hawaii topped all states in three elements in 2018, leading the U.S. in career, social and financial wellbeing. Hawaii is also the only state to be among the top-ranked states in all five elements. 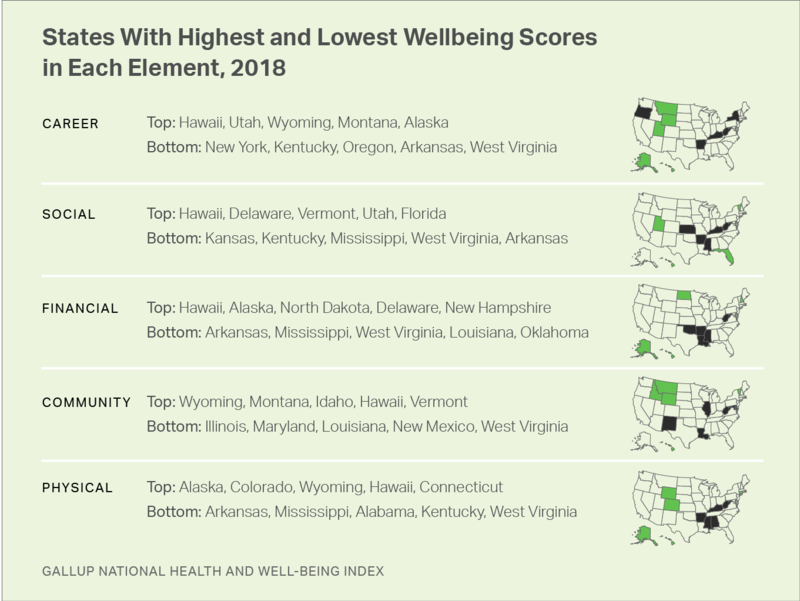 Delaware and Vermont followed Hawaii in social wellbeing, while Utah and Wyoming rounded out the top three in career wellbeing. Alaska and North Dakota were other top states for financial wellbeing. Wyoming, Montana and Idaho, all from the Mountain West, were the top three states in community wellbeing. Colorado, a perennial top state in physical wellbeing, was edged out only by Alaska and was followed by Wyoming. The major headwinds in wellbeing nationally that were present in 2017 were less prevalent in 2018, as the U.S. decline compared with the year before was much milder. The associated net change among states in 2018 reflected this, resulting in a more balanced year-over-year change. Still, the national decline in wellbeing since 2016's high point has widened, revealing a substantial two-year drop. Improving and sustaining high wellbeing is vital to any population's overall health and to its economy. Prior research has shown that high wellbeing closely relates to key health outcomes such as lower rates of healthcare utilization, workplace absenteeism and workplace performance, reduction in obesity status, and the new occurrence of chronic diseases. Wellbeing is also a predictor of numerous business outcomes such as employee engagement, customer engagement, turnover and workplace safety, which can affect a state's ability to reach its economic potential. Recent research has also shown a strong link globally between wellbeing and migration intent. The crucial importance of holistic wellbeing, too, is underscored by the 2018 results. Research has shown that having high wellbeing across most or all elements results in a variety of better outcomes than for physical wellbeing alone. Hawaii's reascent to its No. 1 ranking aptly reflects this, as Hawaii is the only state to rank in the top five across all five essential elements of wellbeing, demonstrating the usefulness of focusing on all of its aspects. Regardless of national trends, states' efforts to improve wellbeing should be customized to meet the unique needs of local constituencies. By focusing on all five elements of wellbeing, states can maximize the return on their investment when designing and implementing initiatives to improve wellbeing. Specific interventions include working with schools, employers, grocery stores and restaurants to foster healthier practices. Other initiatives can involve working with government and various agencies to enact changes that increase opportunities for healthier lifestyles and community life, like more walkable and bike-friendly environments, farmers markets and social activities. Regardless of specific programs or actions, potentially the most important aspect to a successful program is strong, uniform, sustained and visible support from governmental and organizational leadership, which can play a pivotal role in providing the foundation upon which a culture of wellbeing can be built. Learn more about how the Gallup National Health and Well-Being Index works. Results are based on surveys conducted by mail and web from January to December 2018 as a part of the Gallup National Health and Well-Being Index, with a random sample of 115,929 adults, aged 18 and older, living in all 50 U.S. states and the District of Columbia. For results based on the total sample of national adults, the margin of sampling error for the Well-Being Index score is ±0.1 index points at the 95% confidence level. The margin of sampling error for most states is about ±0.8 points, although this ranges from about +0.5 points for large population states to about ±1.9 points for the smallest-population states. All reported margins of sampling error include computed design effects for weighting. Prior years of measurement were based on telephone interviews conducted daily from Jan. 2-Dec. 30 of each year. In 2017, 2016, 2015, and 2014, a total of 160,498; 177,192; 177,281; and 176,702 interviews were completed, respectively. Each daily sample of national adults for data collected between Jan. 2, 2014 and Sept. 1, 2015, comprised 50% cellphone respondents and 50% landline respondents. Each daily sample from Sept. 1, 2015-Dec. 30, 2016, comprised 60% cellphone respondents and 40% landline respondents. Daily samples in 2017 comprised 70% cellphone respondents and 30% landline respondents. Additional minimum quotas by time zone and within region are included in the sampling approach. The means of data collection (e.g., mail/web versus phone) can result in differing estimates for some metrics in randomized nationwide polling. Gallup has extensively studied these effects and has applied scientifically determined mode adjustments to its 2018 estimates to ensure comparability with the phone-based estimates that preceded them, thus effectively preserving past trending. The U.S. adult uninsured rate rose to 13.7% in the fourth quarter of 2018, its highest level since the first quarter of 2014. The percentage of Americans putting off medical treatment due to costs remains steady, but rates are still up from over a decade ago, suggesting rising costs are winning out over healthcare reform. In early November, about one in six Americans approved of Trump on the economy but not on healthcare. Addressing their concerns could have helped the GOP electorally.